Fostering a child's positive emotional health during a divorce can show positive results. 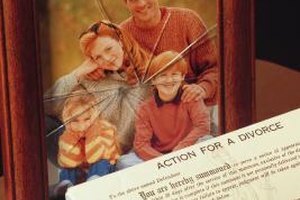 Divorce has a profound effect on all members of a family. However, children in middle childhood, ages 6 to 12, may be especially vulnerable because of the development of constructive social relationships and self-esteem during this stage of life. Changes in emotional support, household structure and effective communication caused by divorce can have a negative impact on a child's emotional health if not handled efficiently. Erik Erikson, a psychoanalyst, identified middle school age children as having a struggle of industry versus inferiority. During this stage of life, a child feels the need to be recognized as being efficient and good at tasks to move on to the next developmental stage of life successfully. The stress of divorce and lack of proper communication and positive reinforcement can lead to feelings of inferiority in comparison to peers or other family members. A child in middle childhood may begin to feel responsible for the divorce of his parents. Nithyakala Karuppaswamy and Judith A. Myers-Walls, in the article "Children's Reactions to Divorce -- Ages and Stages," state that children in this age group may blame themselves for a divorce and experience heavy guilt. Parents can help comfort or possibly eliminate these feelings of guilt by repetitively reassuring the child that the divorce isn't his fault. Specialists with the University of Missouri Extension explain that children in middle childhood may experience negative psychological effects during and after a divorce, such as nightmares or grief for the loss of a parent. Irrational fears about a changing lifestyle or believing that a parent is actually lost can weigh heavily on a child's maturing cognitive reasoning. Talking to children honestly about how life will be different while effectively listening to and addressing their fears can help in easing the transition to a unfamiliar way of life. The effects of divorce on children in middle childhood can be lessened by a healthy support system. As a child becomes more independent and begins constructing rational and concrete thoughts about life, she will likely grow to understand divorce and transition to a new lifestyle successfully. Divorced parents should maintain close and open relationships with their children in orderto set the foundation for positive emotional growth and self-esteem.